The Narmada River flows for more than 1,300 km (808 miles) and crosses three different Indian States (Madhya Pradesh, Maharashtra and Gujarat) before flowing into the gulf of Khambhat (Bharuch), north of Mumbai. Since the mid 1980s, the 25 million people living in the river valley strongly opposed the construction of a huge system of dams, including three large structures: the Sardar Sarovar, Indira Sagar and Maheshwar dams. 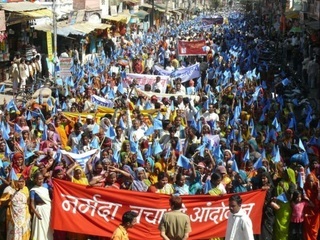 Local citizens formed the Narmada Bachao Andolan (Save the Narmada Movement), a grass root coalition of farmers, fisherfolks, landless farmers and also urban citizens in India, strongly opposed to the projects and political agenda on water and energy of the Governments of the three Indian States. Among the international donors and funders, the World Bank was initially the main sponsor with an allocation of US$ 450 million for the most known dam, the Sardar Sarovar project. In 1993, following widespread protests, both in India and abroad, the World Bank withdrew from the project. This happened for the first time in the bank's history; the Morse Commission, set up for this purpose, conducted an in deep study of the case and released a scathing report (1), published as a book in 1992. This has produced an important change in the WB policy in the world, and drew attention of international media on the WB funded projects worldwide and their negative impacts. Project Details The project is composed of 3,000 small, 135 medium and 30 large dams. Out of them, the Sardar Sarovar Project (SSP), the Indira Sagar Project (ISP) and the Maheshwar Dam are mega dams. The first is 138 meters high and generating an electrical capacity of 1,450 MW, would irrigate more than 1.8 million hectares.The third one should provide 400 MW of energy. A very broad movement in India. One of the leaders,Medha Patkar, became well know and influential beyond the Narmada Bachao Andolan. Self Immolation in neck deep waters (Jal Satyagraha) for days long portests. Development of Alternatives If the principle land for land as per the Indian law cannot be fulfilled, opposition movements ask for the scrap of the dam projects, and the cancellation of any displacement scheme. Why? Explain briefly. The project started despite the local residents opposition, and it is still planned to built other dams, but during all this time the Court has decided to replace the displaced families in cultivable territories, and to investigate the violence and bribery the residents had suffered. Corporate Hijack of Water. Shiva,Vandana; Radha, Holla Bhar; Afsar H., Jafri; Kunwar, Jalees. Ed. NAVDANYA. 2002. Linking of Indian Rivers: Some Question n.1. Ramaswamy R., Iyer. Ed. Research Foundation for Sciene,Technology and Ecology. 2003. The impact of the River Linking Project n. 2. Shiva,Vandana; Kunwar, Jalees. Ed. Research Foundation for Sciene,Technology and Ecology. 2003. The rule of water. Statecraft, ecology and collective action in South India. Mosse, David. Ed. Oxford India paperbacks. 2005. Baviskar, Amita. In the belly of the river: tribal conflicts over development in the Narmada Valley. Oxford University Press, 1999. Other Comments All dams have their own particular stories to be told. This is an effort to describe the overall issue.